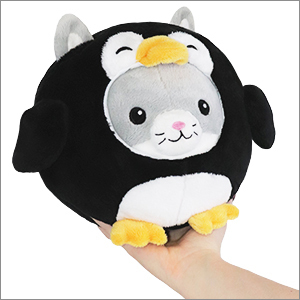 Undercover Kitty in Penguin: An Adorable Fuzzy Plush to Snurfle and Squeeze! Oh the cool, icy gaze of a cat. What does she see with that frosty stare? She sees PENGUINS! Wobbly, floppy cuddly penguins, who care not for a cat's cold and aloof demeanor. Oh, how she wishes to be one of them! Well, this Kitty in Penguin is living out her dreams as that most affable of animals! Give her the warmth of your hugs, it's cold out there.